AZ Drywall Finishing is here to deliver exceptional commercial drywall services across Illinois. Our Chicago-based drywall contractors are able to meet and exceed your design expectations with high-quality outcomes that are sure to enhance the success of your business. We work hard to expand our skillset to incorporate a variety of industries, and will rely on proven practices to ensure that your facility is completed perfectly the first time. For nearly 20 years, AZ Drywall Finishing has worked to create high-quality results that can match any design plan and budget. Today, we’ll highlight a few industries that we have excelled in, as well as the value that our drywall finishers can provide for your personal project. If you’re ready to learn more, contact us today, and be sure to ask for your free estimate! Commercial franchises rely on quality and precision at every corner to deliver an expected level of quality for every customer. Our drywall installation services will create a building that perfectly matches your design specs, working hard to match every curve and detail for a complete outcome. From the texture of your interior walls to the design of your front entrance, every element must be handled perfectly in order to achieve the most satisfying results. Our metal stud framing and drywall installation experts can enhance your project every step of the way. Be sure to request an estimate from us before you break ground! Luxury and quality are essential for spas and salons that rely on beautiful appearances to make clients feel calm and relaxed. Our commercial drywall team has the experience and equipment needed to deliver an ideal result for this build, including moisture-resistant wallboard for any rooms exposed to moisture. AZ Drywall Finishing is proud to build for numerous happy clients, including Mario Tricoci© in River Forest and Orland Park. 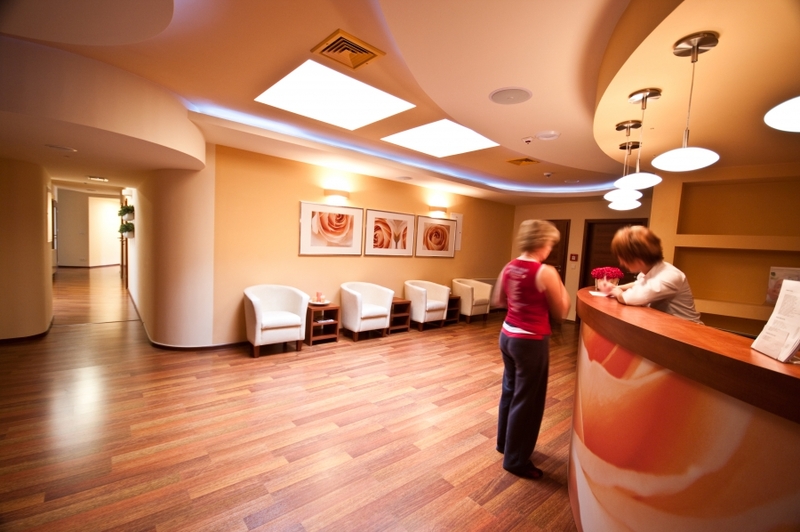 We can deliver a full range of services to create the most luxurious look for your facility. Installing drywall in the food industry relies on health and safety standards that are different from other businesses. 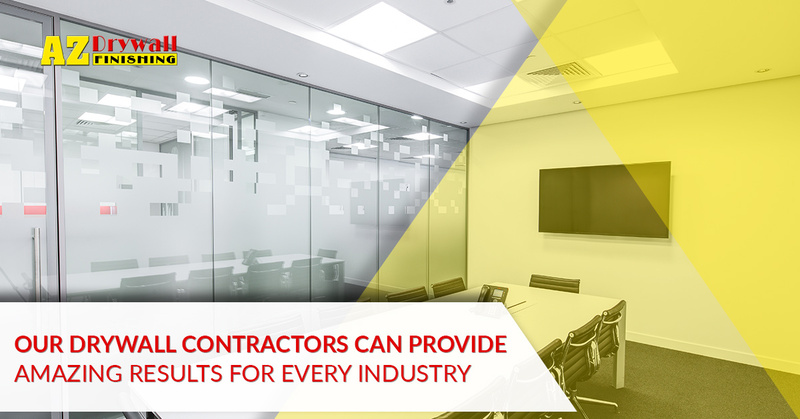 Agencies such as the Food and Drug Administration (FDA) deploy mandatory guidelines and rules concerning sanitation and overall cleanliness, making it essential for your commercial drywall company to have the skills to deliver the perfect build on the first try. Each franchise deploys its own unique style and layout, all of which can be achieved by our drywall finishers in a fast, easy, and affordable manner. While your focus will be on the aesthetics of your commercial drywall installation for the retail, service, and food industries, plants and commercial warehouses place a higher focus on durability and safety. Precision is expected in these high-output facilities, and heavy loads can place considerable strain on all of the surfaces present. In order to prevent costly and otherwise unsafe outcomes in your facility, you will need to contact a local drywall company for a complete consultation. AZ Drywall Finishing is here, and our commercial drywall contractors are ready to enhance Chi-Town projects. For nearly 20 years, our drywall contractors have worked to deliver precision outcomes to meet every building plan, including specialty builds. If you’re looking for long-lasting results for your facility, be sure to contact us today! You may think that manufacturing plants and hospitals have nothing in common, but the truth is that medical facilities require a sturdy drywall plan to perform beautifully under the heaviest use. Hospital beds, meal carts, and a variety of other vehicles may be deployed in your facility, creating a major risk for the beauty and integrity of your finished walls. AZ Drywall Finishing is here to deliver exacting results to meet every healthcare need. We’ll work with you to find the protective plates and pieces needed for busy corners, and can address any issues with your current system. AZ Drywall Finishing is here to scale our drywall services to match every project, from large hospitals down to private residences. We can help you find the most advantageous and cost-effective solution for your residential drywall needs, including insulation, wall finishing, and more. Homeowners harbor their own unique styles and design plans, and our contractors will take the time to listen and plan accordingly to achieve the most customer satisfaction. Our company specializes in commercial drywall services, but we’re always happy to help homeowners in need! Builders are faced with the challenge of meeting their design specifications while also tailoring the result to best match the customer’s preferences. Regardless of the industry or designed use, AZ Drywall Finishing is here to provide comprehensive support. If you’re looking for a commercial drywall company in Chicago with the ability to deliver precise, affordable, and long-lasting results for your project, contact us today for assistance!